"What about those times when, for whatever reason, a big console is not available? That's the time for ingenuity and some special techniques"
I really learned a great deal from this article about how to make the most of a small mixing console when a big console is not available or practical for the situation. 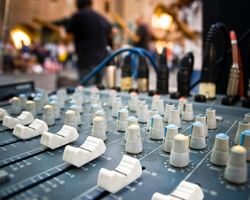 Some really great ideas here for any sound technician professional. In fact, I am going to consider purchasing a micro mixer that will fit inside my tech tool kit. Just like you would carry a DI box, or cable tester, why not a micro mixer? Read the article to see all the ways a small mixer will get you through any sound disaster or situation. There are so really great micro mixers available from companies like: Mackie, Behringer, Soundcraft, and Yamaha.